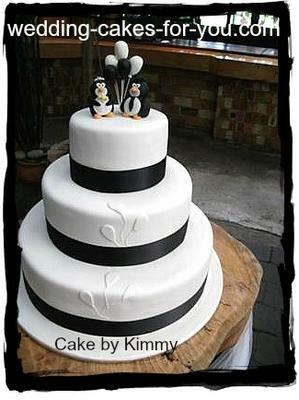 Welcome to the black and white wedding cakes gallery. 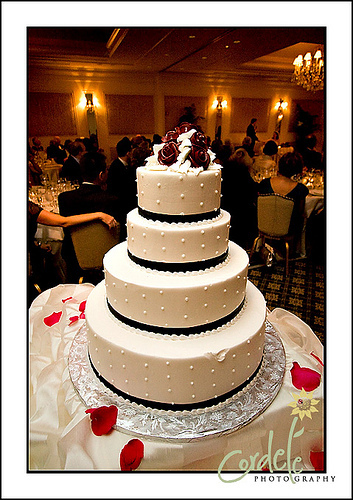 Red and black wedding cakes are also included on this page. 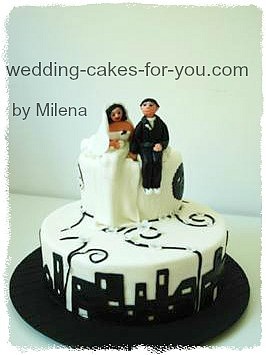 This website is for YOU - Brides and Cake Decorators. You will get new ideas for your reception, learn a trick or two about making a wedding cake, and see what others have done. You can share your cakes as well. 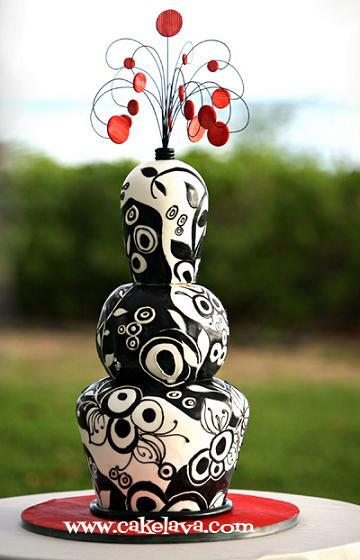 This whimsical design below is by cakelava. Rick Riechart is the artist and resides in Hawaii. He makes amazing wedding cakes. 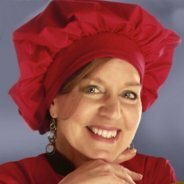 There is a link to the interview with Rick at the bottom of the page and if you are interested in cake decorating classes, he travels worldwide. The cake pictured below is a five tiered fondant covered extravaganza! It's a great example of mixing the square and round shapes. The base is a silver plateau. Black and red together are a classic color combination. 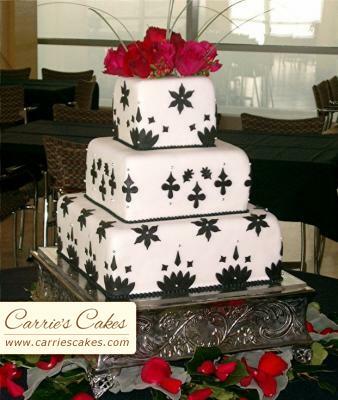 The square fondant cake on a sliver plateau has black fondant cut outs or stencils. 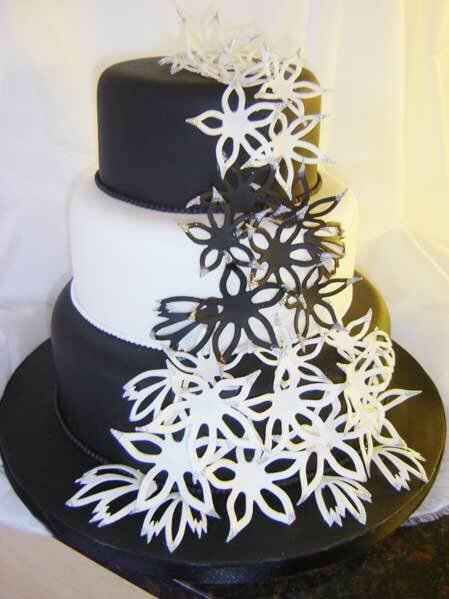 This can be accomplished with cutters and rolled out gumpaste or sugarpaste for a very sophisticated look. 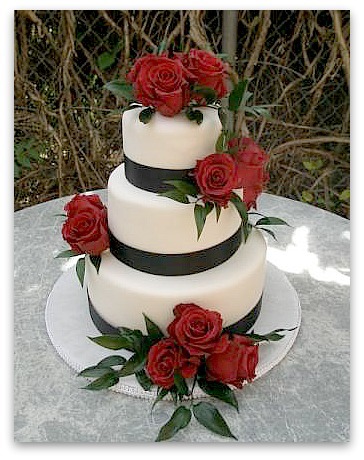 Simple Swiss dots on a buttercream cake with ribbons and red rose petals is another basic but elegant design. It looks like someone could not wait to taste test the icing LOL. 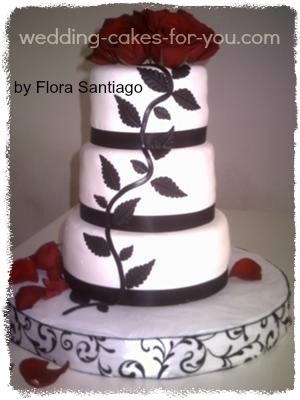 Red roses are a nice accompaniment to this simple yet elegant black white and red wedding cake by Sedona Sugar Art. 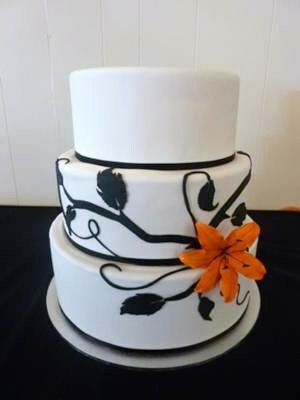 The ribbon looks like it is made using fondant, although you can substitute real fabric on a cake safely over sugarpaste. Use a dab of royal icing to glue the fabric ends together. On this website people share their ideas and helpful advice and tips every day. 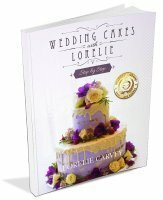 If you have a wedding cake story to share go here. 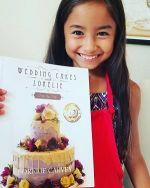 Flora Santiago is one of the first cake decorators who shared her talents here at Wedding Cakes For You. She now owns a bakery business in L.A. 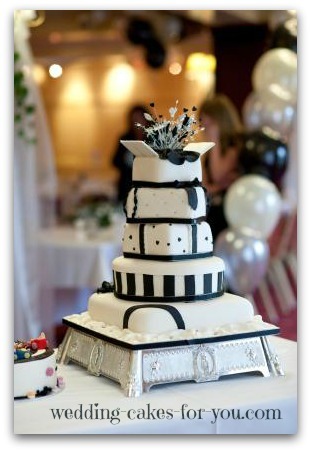 Check out her black and white wedding cake entry. Kimmy from new Zealand is one of the most generous visitors here. 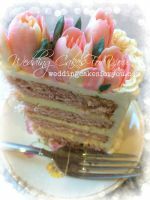 She visits the site often and shares her beautiful creations, tips and helps other visitors who have questions. Thank you Kimmy. 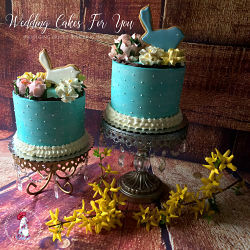 Visit her cake pages and say hello or just admire her world class decorating. 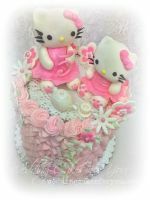 Milena, a Macedonian living in the Netherlands made this adorable little cake. Her story is really quite interesting too. 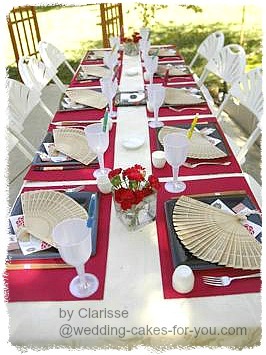 Clarisse shared her Asian inspired shower decorations and her black white and red wedding cake, which is very cool. Click the pics to see the details. 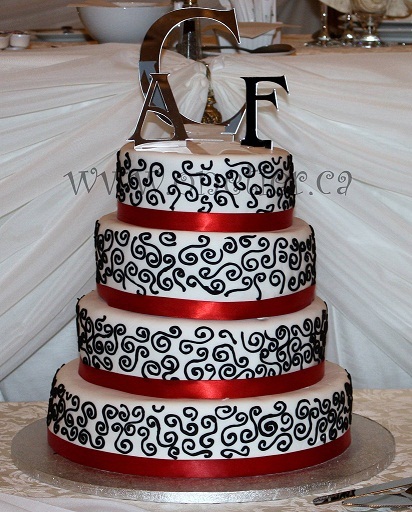 One Tier at a Time created this handsome wedding cake with scrolls and red ribbon accents.